Advanced – and expensive – immunotherapies have expanded the arsenal of available treatment options for cancers either resistant or recalcitrant to more common approaches including surgery, radiation, chemotherapy, and hormone therapy. Although compelling as a therapy, clinical responses to immunotherapies have been limited to a small cohort of patients, prompting pursuit of additional strategies for broader therapeutic impact. With 2018’s failure of promising candidates tested in combination with approved immunotherapies comes a great need for ongoing and rapid development of new molecules and innovative approaches to qualify candidates for efficacy potential. A subset of immunotherapies, known as immuno-oncology (IO) drugs, help reverse a patient’s compromised capacity to mount an effective anti-cancer immune response. IO drugs boost the body’s own immune-cell mediated tumor cell killing, and may be given either as mono or combination therapies. By September 2017, the immunotherapy landscape included 26 approved drugs, with six immune checkpoint inhibitors aimed at 18 different tumor types. While these IO drugs have led to increased patient survival, positive outcomes have been observed in only a minority of patients. Recent reports indicate that 25% to 30% of cancer patients, and as low as 10% for patients with some cancers, achieve objective, nontoxic responses on these therapies. The clear need for diverse IO therapeutic options with better and safer molecules has launched an unprecedented pursuit of candidates in this space. The most recent survey from the Cancer Research Institute revealed that in the past year alone (September 2017 to September 2018), there was a 67% increase (2,031 versus 3,394) in the number of preclinical candidates in the IO pipeline, representing over 300 targets in development by more than 900 companies worldwide. 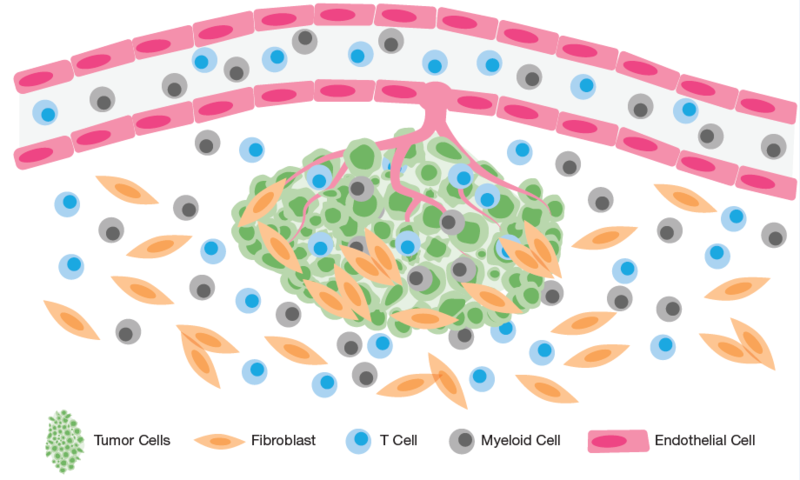 Tumors do not propagate in isolation, but as part of a complex, hierarchical interaction of stroma, vasculature, immune cells, and cancer cells that together comprise the tumor microenvironment. This complexity explains the difficulty in broadly predicting drug candidates’ behavior based on data obtained from isolated tumor cells or cell monocultures. One of the most promising next-generation therapies involves a class of molecules called indoleamine-pyrrole 2,3-dioxygenase (IDO) inhibitors. The IDO enzyme’s immune suppressive effect allows tumors to escape immune surveillance—and undermines patient survival. Preventing this via a strategy known as IDO blockade represented a compelling approach for mounting a counterattack on cancer cells within the tumor microenvironment (TME), propelling rapid development of IDO inhibitors such as epacadostat, indoximod, and navoximod. Preclinical data suggested that despite limited anti-cancer efficacy as monotherapies, IDO inhibitors in combination with approved cell cycle checkpoint inhibitors might boost restoration of immune capacity in patients, leading to increased cancer cell killing. Intriguing reports on combinations from small preclinical studies prompted several companies, led by Incyte, NewLink Genetics and Bristol-Myers Squibb, as well as Roche’s Genentech unit, AstraZeneca, and Pfizer to discover or acquire their own IDO-related assets. Unfortunately, the hope and hype behind this IDO strategy unraveled when the first readout from the Phase 3 KEYNOTE-252/ECHO-301 trial in melanoma patients missed its endpoints. Not only was this failure devastating for melanoma patients, it also resulted in the cancellation, suspension, or downsizing of several IDO combination trials involving thousands of patients that effectively torpedoed the IDO strategy. Efforts to validate the combination of IDO and immune checkpoint inhibitors involved enormous investment, while also monopolizing resources that could have been directed to other drug candidates. With innovative preclinical services such as phenotypic profiling, it was entirely feasible to flag these potential failures earlier in development. Modeling the Human Stromal and Vascular Tumor Microenvironment In Vitro. In BioMAP oncology systems, PBMCs recapitulate the immune compartment and the HT29 colorectal adenocarcinoma cell line or the H1299 non-small cell lung cancer cell line represent the tumor. The third component in each system is either fibroblasts to model the stromal compartment (StroHT29 and StroNSCLC systems) or vascular endothelial cells to model the vasculature (VascHT29 and VascNSCLC systems). BioMAP Oncology Panels were built to assess the effect of drug candidates in a complex co-culture of early passage human primary stromal or vascular and immune cell types, together with a cancer cell line, modeling the human TME. This translational systems biology approach recapitulates intricate tissue and disease microenvironments in fully human, co-culture model systems to enable readouts on clinically relevant protein biomarkers. By recapitulating the tumor-mediated immunosuppression seen in vivo, BioMAP Oncology Panels can detect restorative immune profiles associated with clinical efficacy of IO therapeutics. Data from studies in these systems suggests that IDO treatments would likely have limited IO potential as monotherapies, consistent with preclinical and clinical studies. To determine whether BioMAP systems could accurately capture the impact of therapies delivered in combination, BioMAP Combo ELECT Panels were used to test individual and combination therapies in a matrix of all possible combinations. Combo ELECT Panels use any co-culture system of choice (in this case the VascHT29 system) for the purpose of statistical differentiation between monotherapies and combination therapies, or to test for drug synergies or antagonisms. Results detailed in the white paper provide compelling evidence that combination therapies can be effectively qualified at varying exposure levels during preclinical development. This is particularly important since combination therapies often do not obey dose-response curves the way individual therapies do, introducing a potentially confounding variable during clinical trials. Importantly, BioMAP Oncology Panels provide results that recapitulate the outcomes of clinical trials, and even real-world use of approved treatments. The power of BioMAP Oncology Panels lies in their ability to provide a robust and unbiased systems biology approach to produce accurate translational results prior to a compound’s use in humans. Compared to animal models that encumber resources or in vitro assays that may not fully capture the complexity of the tumor microenvironment, BioMAP Oncology Panels provide high throughput and physiologically relevant insight into IO and other translational biomarkers in human patients. BioMAP Oncology, BioMAP Combo ELECT, and other BioMAP services offer high throughput and reproducible evaluation of the impact of standardized and test compounds and combinations on biomarkers relevant to efficacy, safety, and mechanism of action to support pipeline progression. With complex co-culture assays of human primary tissue and tumor cells, it is possible to cost-effectively generate accurate and reproducible data during preclinical studies to help guide therapeutic strategies and prioritize development candidates. BioMAP Phenotypic Profiling can be used for rank-ordering candidates or for screening against thousands of compounds to generate reliable and validated data about safety, efficacy, toxicity, and mechanism of action—so only the most promising candidates move forward for development. Phenotypic profiling – based on human cell and tissue disease systems – models complex biology to provide a robust and powerful view of how human cells respond to approved or experimental therapies, or any combination thereof. The in clinic, practical IDO inhibitor experience underscores the critical need for earlier and more translationally relevant target validation and qualification of IO therapies and combinations. Indeed, it is possible – but unfortunate – if poor clinical results for IDO inhibitors undermine pursuit of next-generation IO therapeutics. Scientists should not lose the appetite to explore novel candidates that function as combination drugs based on the experience of one drug’s Icarus-like rise to glory and subsequent fall. As better qualification programs are put into widespread practice, everyone will benefit.